For those who choose to use our custom AMC “T” Sump oil pan, this is an external pickup kit that not only includes the special pickup, but an in-line screen protector with AN -12 fittings. 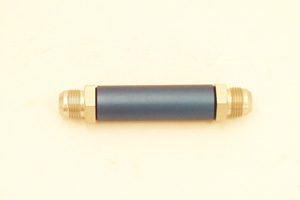 This kit comes with a 3/4″ diameter steel tube with screened pickup cup with a -12 fitting, . This kit can be used to convert a standard wet sump pan to one used with an external oil pump or to add an extra pickup to a dry sump pan. Welding is required for installation.